Take some personal time for yourself to rejuvenate and recharge at the Centre. Our yoga getaway is the perfect way to relax the mind and body. The getaway includes two nights accommodation in our turn-of-the-century cozy farm house. Delicious vegetarian meals are prepared for you each day. You can enhance your sense of well-being by enjoying a treatment available at our on-site Wellness Centre. Wondering exactly what you’ll be doing during your time at the Centre? Here’s a detailed schedule followed by an overview of the weekend. * The sauna is weather dependent and is not available during hot or dry periods due to fire hazards. It is only available on Friday evening. + We do not serve coffee during the Yoga Getaway, but you are welcome to bring your own. All of our Yoga Getaway instructors are experienced and compassionate teachers, who completed their 200 hour training at the Salt Spring Centre of Yoga or Mount Madonna Center in California, both Yoga Alliance registered schools. Many of these teachers are also on our YTT faculty and have further expanded their skills and expertise through specialized trainings. Each teacher is unique in style and presentation, while upholding the common aim of classical yoga – uniting body, breath and mind. While actively teaching in their local communities, these dedicated yoga teachers are generously volunteering their time and energy in support of SSCY as well as the greater community itself. Our large pool of over 25 instructors allows us to vary instructors for each yoga getaway, bringing a richness and diversity that promise to inspire your yoga experience! We offer Level 1 and Level 2 yoga classes so you choose which best suits you. Enhance your sense of well-being by opting for one of the many Ayurveda and bodywork sessions available at our Wellness Centre.Take time outdoors, hiking or exploring the island, or going to town and checking out shops, galleries and Salt Spring’s famous outdoor Saturday market (April – October). Enjoy the enriching evening activities and presentations. You could also choose to simply relax in the Centre gardens or library, and enjoy personal time in a serene setting. Our retail pop-up shop sells a variety of yoga props, SSCY merchandise (such as clothing and mugs), books by our teacher Baba Hari Dass, and kirtan albums. We accept visa, mastercard, and cash. There is no cash machine onsite. Check in, have a cup of tea and make yourself at home. For early arrivals, optional treatments from the Chikitsa Shala Wellness Centre are available and a great way to leave the week behind. Then begin in the late afternoon with a yoga class (level 1 or 2). After class enjoy a delicious dinner and evening orientation, unwind with a guided relaxation and sauna before settling into bed. Slow moving, basic postures with an emphasis on alignment and breath while building concentration, strength and softness. Some flow as well as sustained postures with modifications to support individual needs. This class is also suitable for those with reduced mobility, anyone new to yoga and those wanting a gentler class. Emphasis and style of class will vary with each instructor. For those who are comfortable in basic postures and want more of a challenge. Class includes some vinyasa flow as well as sustained postures including inversions and hand balances. Modifications are provided as well as more challenging options to support a range of capabilities. Emphasis and style will vary with each instructor, who will be open to posture suggestions. Spend the early afternoon outdoors, hiking or exploring the Ganges shops and art galleries, and the famous Saturday craft and farmers’ market. Alternatively you can stay at the Centre, relax in the library, read by the fire or pond, or stroll through the gardens and grounds. In addition, you could choose a treatment at our Chikitsa Shala Wellness Centre. Late in the afternoon return for a the class that works for you – either restorative yoga* OR a mixed levels class, followed by dinner and a casual evening with homemade dessert and tea and an optional evening program. * Restorative yoga is a very nurturing, relaxing form of yoga. All poses are done in a reclining position, using soft supports such as bolsters, blankets, cushions to create the classical actions of the pose, reaping the benefits with minimal metabolic effort. A quieting and mindfulness practice that supports physical and mental rejuvenation and reduces stress. After your Sunday morning yoga, brunch, and farewells, you’ll head for home refreshed, renewed and ready for the next challenge life brings you. Extend your stay at the Centre by adding Personal Retreat time to the start or end of our Yoga Getaways. In this case, it is not necessary to fill out a separate personal retreat registration. Simply indicate the dates you would like to arrive and depart on your program registration. A discount for your Personal Retreat will apply if your total time at the Centre including program nights is five nights or more. The total cost for the Yoga Getaway will vary according to the accommodations type chosen. * Camping is available May – September only. Campers are asked to bring their own tents, sleeping bags, pillows, linens and towels. 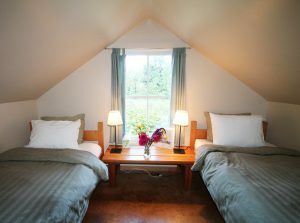 ** Shared Rooms have 2-3 twin beds per room. Please contact us if you have a preference or questions about shared accommodations. The fees listed above include $205 tuition for classes, an evening program, accommodation (where applicable), vegetarian meals, tea bar and facility use, from Friday afternoon through Sunday brunch. Taxes are included. Many guests attribute the addition of an Ayurveda treatment or massage as a wonderful compliment to their weekend. If you’re interested in receiving a renewing wellness treatment, please call us at least 48 hours in advance to ensure that your preferred times are available at 250-537-2326. For more information about treatment options, please see the Chikitsa Shala Wellness Centre page. What is included in a Yoga Getaway? Yoga Getaway fees include accommodations (either in-house or camping), meals, access to the self-serve tea bar. Please note, we do not serve coffee during the Yoga Getaway. The fees also include the classes and evening programs. Check in is between 2 – 4 pm on Friday. The program finishes around noon on Sunday. What type of classes are offered during the Yoga Getaway? At each yoga asana class time there will be 2 classes offered for you to choose from: a Level 1 or Level 2 class; or a Restorative or a Mixed Levels class. Level 1: Slow moving, basic postures with an emphasis on alignment and breath while building concentration, strength and softness. Some flow as well as sustained postures with modifications to support individual needs. This class is also suitable for those with reduced mobility, anyone new to yoga and those wanting a gentler class. Emphasis and style of class will vary with each instructor. Level 2: For those who are comfortable in basic postures and want more of a challenge. Class includes some vinyasa flow as well as sustained postures including inversions and hand balances. Modifications are provided as well as more challenging options to support a range of capabilities. Emphasis and style will vary with each instructor, who will be open to posture suggestions. Restorative Yoga: A very nurturing, relaxing form of yoga. All poses are done in a reclining position, using soft supports such as bolsters, blankets, cushions to create the classical actions of the pose, reaping the benefits with minimal metabolic effort. A quieting and mindfulness practice that supports physical and mental rejuvenation and reduces stress. Camping is available from May to September. We offer unmarked tenting campsites in a quiet forest setting or in the sunny open meadows. All have access to hot outdoor showers and outhouses; however, there is no electrical hook‐ups. Campers are asked to bring their own tents, sleeping bags, pillows, linens and towels. Please note: there are no open fires, kerosene lamps or candles allowed on the land. The rooms are cozy with comfortable beds and linens. 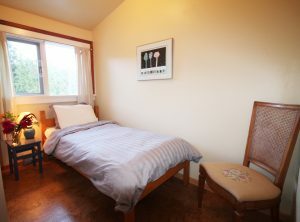 Private rooms have 1 twin bed; shared rooms have 2-3 twin beds, depending on the room. Rooms have nightstands, bedside lamps and dressers (alarm clocks are not provided). All rooms, except our one room with an ensuite, have shared washrooms. 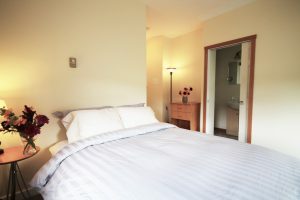 Can I pay for shared accommodation even though I am coming on my own? Yes! Shared accommodation rates are available for Yoga Getaways and other programs to those booking with a friend or family member as well as those coming on their own. Shared accommodations have 2-3 twin beds per room. Shared rooms are listed as having 2-3 beds and I’m coming with a friend. Can we get a room for just ourselves? Rooms with only 2 beds book up quickly and early. Once these are booked, guests will be booked into rooms with 3 beds and will most likely share the room with another guest. Please contact us if you have any questions about availability. What is provided at the Centre? Yoga mats and props are provided (If you prefer to bring your own yoga mat we welcome you to do so). In-house guests: all linens and towels are provided and there is shampoo, conditioner and body wash in the washrooms for your use. Please bring personal toiletries, comfortable clothing, a swimsuit for the sauna (when available due to weather conditions) and an alarm clock. We do not wear outdoor shoes inside, so feel free to bring slippers. A water bottle is also a good idea. Campers are asked to bring their own tents, sleeping bags, pillows, linens and towels. We have posted directions on our Getting Here page. From Vancouver allow four to five hours (door to door) by ferry and car or transit; 25 minutes airtime by floatplane plus ten minutes by car/taxi. From Victoria, allow a comfortable two hours door to door by ferry and car. We have posted more details on our Getting Here page.